Home » All Forums » [Distributed Computing] » Folding@EVGA » Points cut in half? When I started folding again this month, my displayed points were roughly half of what they were when I stopped last month. I'm currently showing about 58 million points but when I stopped last month I was over 111 million. Anyone else seeing this? MONITOR 1 - Dell U2713HM 27"
MONITOR 2 - ASUS VS248H-P 24"
I would not say half, that would set us back 2 or 3 Years. For your GPU - EVGA GTX1080Ti SC2 Hybrid you are at the correct Points. You also have some down time today so you may not be getting WU's back to back. For the most part I have the same card and I am not that far ahead of you in Points today. Well the web interface shows just under 59 million points but my signature shows over 113 million. So yeah, a little more than half. https://folding.extremeoverclocking.com/ this site for the last 2 days has been really slow as well. If you are talking about EVGA's it can be 2 or 3 days behind sometimes so get it another day. This one. It's always been accurate before. There is always delays between then EVGA and https://folding.extremeoverclocking.com/ this is not uncommon. NEGATIVE POINTS!!! AHHH!! OMG!!! Look here. Good Info here as well. You can also ask about this over on https://foldingforum.org/ The Support Forum for Folding At Home. That's not what I'm experiencing at all. Besides, it's been almost a month since I last folded so it's not a 24 hour delay thing. I've never seen this happen before and I'll just assume no one else has either. Not sure why its showing 58 million on the above page. 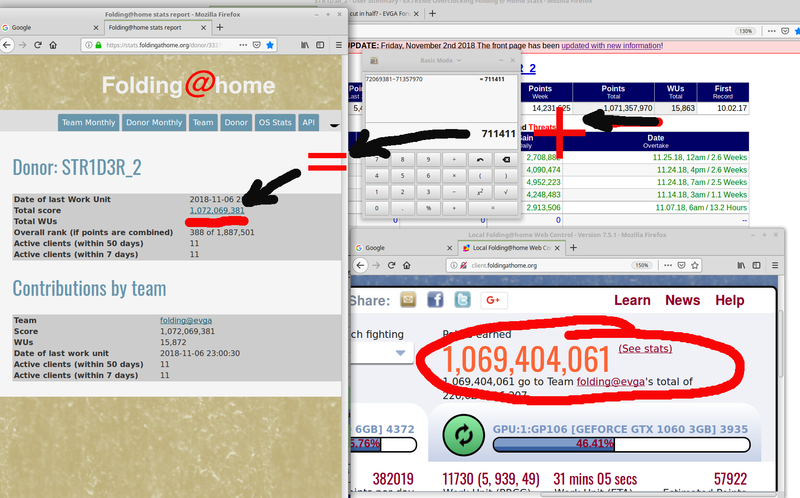 If you go look your points up on extreme over clockers and folding at home's team page, they both show your over 113 million. You may need to go to the Folding at home forums and ask Bruce if anyone else is having the same issue. It might even fix it's self tomorrow. Yesterday it would never show me my points on that Client page, and today everything is fine. For me that web interface (I rarely open it) has been off by a few million ever since the points system went down on 10/18. Straight from the latest hourly update directly from the published flat file you have currently 114,390,920 points, so again, no clue at all why that isn't showing the correct points. I never have used the Web Interface. I wonder if the OP ran the Client Tool and showed the correct number. Here is my current points pre 6 pm update. the calculator is my next update. the web control has been off since the October issue. Not that I mind, I know the points are there. I don't know. I don't keep up with any issues that happen with folding. I only fold for a few days a month and the last time was early October and didn't see any issues. I was just surprised to see almost half of my points gone this month. I've never had an issue with the Web Interface before. I don't know what the Client Tool is but the Advanced Viewer thing doesn't seem to show my points at all. It will be an icon on your Task Bar Bottom Right. "D:\Program Files (x86)\FAHClient\HideConsole.exe" "D:\Program Files (x86)\FAHClient\FAHClient.exe"
I think most members run this way but not really sure. Like I said previously, the Advanced Control doesn't show my total points. As to the issue with the way it is in the webcontrol browser I would go right over to Stanford's forum and see what they say. They maybe able to give you more info over there. Register for an account, sign in and post in the correct subforum. I have not seen anything like that in all the years I been folding. But rest assured you still have your points. May want to let EVGA's admin that does the folding points you are having an issue so they do not think you are gaming the system. Somewhere here I read a post stating that using the Web control caused a decrease in point production. I never questioned this and switched to the advanced control, set monitors to sleep and check points with my phone (or a desktop) on the stats page and the link I posted above. Best to take bill's advice and post there.